Home of the RRP Diaper Pattern: Classic RRP (Rita's Rump Pocket) pattern. Classic RRP (Rita's Rump Pocket) pattern. This pattern is a one-size fits most flannel fitted pocket pattern that does not have closures. It fits tiny babies to large toddlers and is very trim. It is a very simple fast diaper to sew up and you can find everything you need to make one at your local Walmart or fabric store. Did I mention that RRPs are also reversible? Use cute prints as the outer and the inner, and you have two cute looks with one diaper. Above is the RRP on a baby and a toddler. Here you can see how folding down the front of the RRP makes the rise shorter for smaller babies. The fleece covers pictured on here are made from the Mile High Monkeys pattern which I can't find any more. But I did find a similar one here. 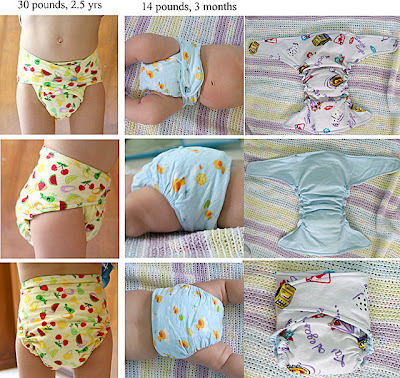 For great FREE diapers and pull-on trainer pattern (which you can make with fleece and it becomes an excellent cover) please visit The Nappy Network. You can literally make a great cover for a buck or less. Here is the free downloadable RRP PDF pattern. I love to sew and I decided to design a diaper that could be made with scraps of flannel and closed with a pin. This way I could sew a great diaper after a quick car trip to a thrift store, fabric store, Walmart, or even a peek in my closet. I love to help out, so if you have any questions/comments please email me at coffeephotolove@yahoo.com .